The easiest way to get to my heart is to make me lasagna. Yes, it is sad, but there is an expressway right to the center of my heart via layers of ricotta cheese, meat sauce, and ribbons of lasagna noodles. I would eat it for breakfast, second breakfast, lunch, dinner, dessert…second dessert. But alas, I have not had lasagna in so long. My gluten sensitivity has slammed that door shut. Oh lasagna…. *sigh* I miss you dearly. THEN waaaaaaaaaaiting for it cool down!!!!! UUUgh. The roof of my mouth suffered many times from not being able to wait. But then…there it was. *Chorus Line Dancers* *Jazz Hands* “Ladies and Gents…I present to you….The Great Laaaasagnaaaaaa.” I dove head first into that big slice of layered heaven. I always looked forward to that meal. Again…a moment of silence for my dear lasagna. A few years ago, my husband surprised me with a homemade spinach lasagna for my birthday. This man does not really cook…but he made it from scratch. Oh it was delicious. It was comfort rolled up in layers of sauciness. But that was the last time I had lasagna. TWO YEARS. My birthday is at the end of the month and my innate need for lasagna has been getting strong. I dream about it. I smell it in the air….in my car. I’m serious. I seriously started thinking that maybe I just smelled like lasagna? Maybe I emit oregano and basil fumes. I guess there are worse things to smell like. Anyways, I decided to remedy my lasagna cravings by using strips of eggplant in place of the noodles. I made an amazing and deliciously thick batch of meat sauce chunked with large pieces of mushrooms. Although there is no cheese or ricotta (blasphemy….I know…if you are a lasagna purist…please, turn your eyes), this cooked up to be layered, saucy, meaty heaven. If you eat dairy, you could easily add a layer of cheese to this. Slice the eggplant lengthwise in 1/4-inch thick slices. I prebaked my eggplant “noodles” in an oven at 375F for 10 minutes while I was making the sauce. I haven’t tried making this without prebaking the eggplant. I’m sure it would work but would just require longer baking time once it is fully constructed. After prebaking the eggplant slices and whipping up the meat sauce, the lasagna is ready to be BUILT! Start with a layer of meat sauce in the bottom of a 9″ X 13″ baking dish. Then place 3 to 4 slices of eggplant in a single layer across the bottom of the pan. Then add another layer of eggplant (stacking on top of the first layer). Top the whole thing with the remaining sauce. Bake at 375F for 25 to 30 minutes, or until bubbly and heated through. Bonus features of my version of lasagna are that it takes a fraction of the time since there are no noodles to cook and no cheese to shred. It also cooks in half the time. You could easily sub zucchini and/or yellow squash for the eggplant. Preheat oven to 375 F. Spray two baking sheets with nonstick spray or line with parchment paper. Set aside. Place eggplant pieces on prepared baking sheets in single layer. Brush both sides of eggplant slices with olive oil. Bake until eggplant slices are tender and beginning to brown, about 5 minutes per side. 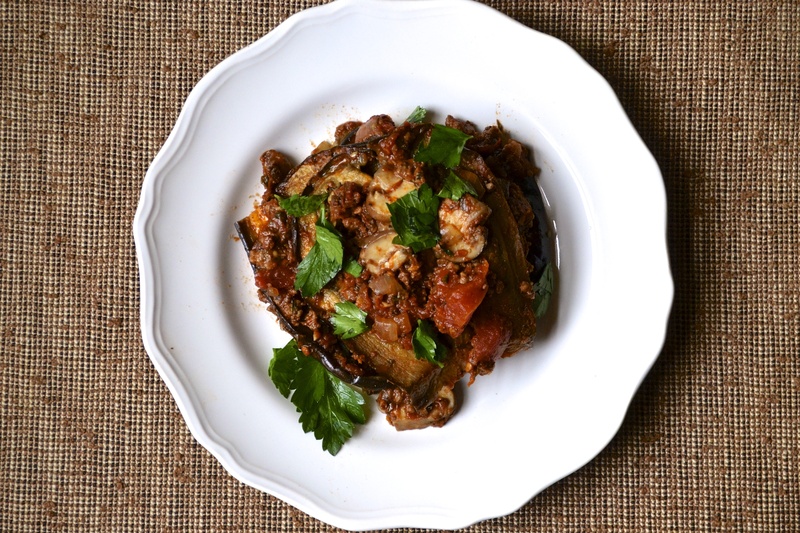 Watch closely and remove eggplant slices as needed if they are cooking too quickly or not long enough. Remove baking sheets from oven and cool eggplant while preparing sauce. Eggplant can be roasted 1 day ahead and refrigerated. In a large sauce pan or pot, brown ground beef over medium heat. Drain excess grease. Return pan to heat and add onion, garlic, and mushrooms. Stirring frequently, brown and cook until onions and mushrooms are tender, about 5 to 10 minutes. Add 2 cans of diced tomatoes with juice, tomato paste, oregano, basil, salt, pepper, and parsley. Bring to a simmer. Allow to simmer for about 10 minutes, stirring frequently. Sauce can be made several days ahead and refrigerated. Spread 1/3 of the meat sauce (about 2 cups) in the bottom of a 9″ X 13″ glass pan. Layer 4 slices of eggplant on top of the sauce. Spread another 1 to 2 cups of sauce on top of the eggplant slices. 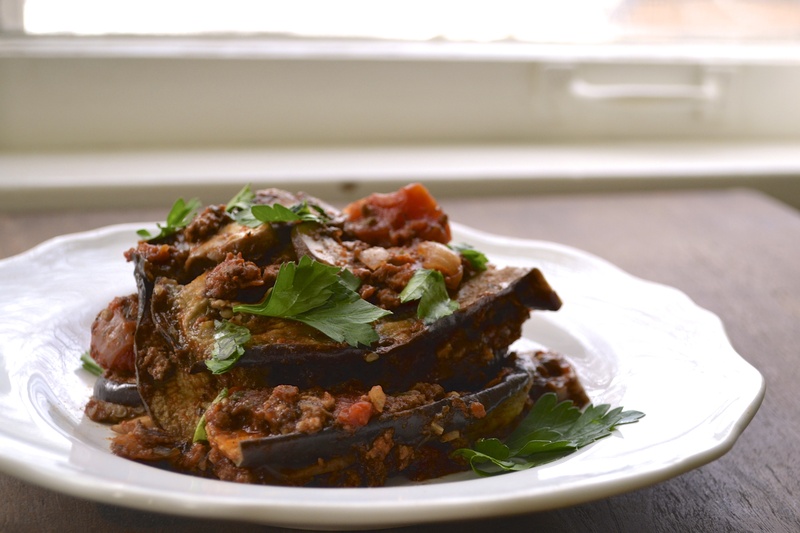 Arrange a second layer of eggplant slices directly on top of the first layer, stacking them. Spoon remaining sauce on top. This can be made 1 day ahead. Cover with foil and refrigerate until ready to cook. 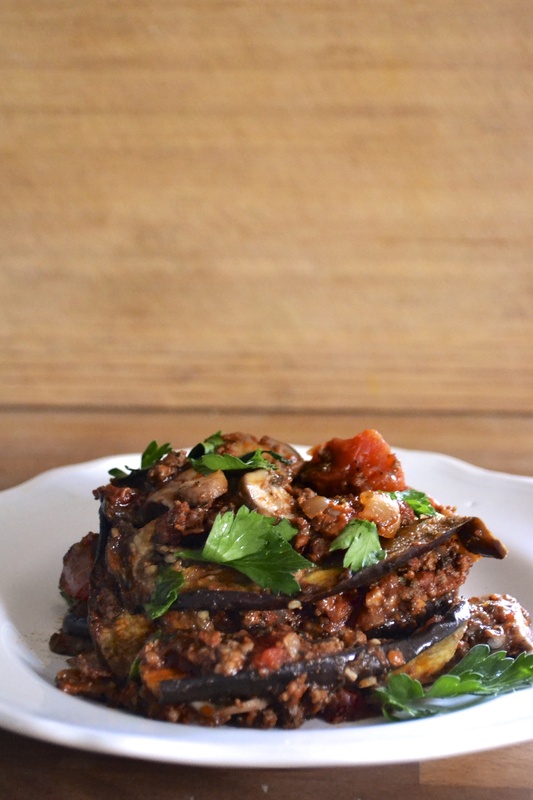 Bake eggplant lasagna until heated through, about 20 to 30 minutes if freshly made or 40 minutes if refrigerated. Serve hot topped with fresh parsley or basil. Looks amazing! I like the suggestion of using zucchini or yellow squash- though I love eggplant, it doesn’t seem to love me back. I’ve also made a gluten free butternut squash lasagna (recipe on the blog) that has quickly become a house favorite! Oh My!! I have to tell you this was just amazing! Not only did I cook up enough ground beef to set aside for Gluten Free taco pizza in a few days..but made enough of the meat sauce to save and put over pasta as it is just delicious!! My 2 and 4 year old helped “cut” all the veggies..we did sprinkle some cheese mind you:) And it was a huge huge hit! As a newbie to Gluten Free for health reasons..thumbs up..way up!!! I love kitchen helpers! Glad everyone loved it. That sauce is amazing. I’ve also served it over portobello caps and on top of spaghetti squash. I like the idea of it as a pizza topping! Mmm. Good luck on your gluten free path. I am very excited to try this tonight. I am the only paleo person in the house so trying to find things that will please both paleo and non-paleo is a must! Thanks! I am sure that is quite a challenge being solo paleo in a non-paleo house. This is a definite crowd pleaser for all. Comfort food at its best! This was a big hit in our house! My daughter made it with ground turkey instead of beef and it was awesome! Excellent! Ground turkey is a great substitute. Soooo good!!! I forgot to grab ground beef but had ground chicken breast on hand and it was amazing!! Loved by everyone in the house – which isn’t always the case w/kids that don’t understand my “paleo ways”! Love the “kid approved” stamp! Yum. I’m excited to try this and it looks MUCH easier than traditional lasagna, and more healthful. Just made this dish for dinner. Great recipe! Thank you, Damon. So glad you enjoyed it. It is definitely one of my faves!!! During my snowed-in Monday, I decided to stock the fridge and freezer. I made two of these! The lasagna was wonderful.. almost beats out a traditional lasagna. Next time I plan on doubling the eggplant to make a more hardy dish. Thank you so much for the feedback. I love this recipe too. So comforting! Perfect for a snow day. Holy cow – tried this recipe last night, and I’m so impressed!! It was delicious! My mom stopped by, and I got her to (reluctantly) try some, as well, and even she admitted it was delicious! I’m officially a fan. Thanks!! Awe! Thank you so much for the kind words! I really appreciate it and I’m so glad that you AND your mom liked the recipe. I hope you try some more of my recipes and like them just as much! I’m definitely going to try this, it looks amazing and the reviews back that up. Earlier today I was looking at some recipes that use yoghurt in place of ricotta, I might try adding that to one batch as well. Por favor,enviar las recetas en español!! No leemos inglés!! So good! Thanks for a great recipe. Made it with ground bison for a nice twist. Nope, you do not need to peel the eggplant.